Anne Fielding, Aesthetic Realism Foundation Faculty. Aesthetic Realism was founded by Eli Siegel. 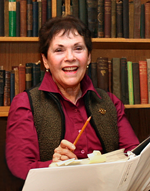 ANNE FIELDING is Director of the Aesthetic Realism Theatre Company. The company presents dramatic productions of groundbreaking lectures by Eli Siegel on the plays of Shakespeare, including Mr. Siegel’s critical masterpiece Shakespeare’s Hamlet: Revisited, and his magnificent talks on works by Molière, Sheridan, Ibsen, Strindberg, George Kelly, Kaufman and Hart, Arthur Kober, Susan Glaspell. The company also performs musical productions, both at the Foundation and at labor unions, libraries, and cultural organizations around the country: Las Vegas, Nevada; Billings, Montana; New Orleans, Louisiana, and Lake George, New York.These productions include “Ethics Is a Force! Songs about Labor,” “The Great Fight of Ego versus Truth: Songs about Love, Justice, and Everybody’s Feelings,” and “Rock ‘n’ Roll, the Opposites, & Our Greatest Hopes!” In October 2011, the company premiered its historic production of “The Civil War, Poetry, and Our Lives,” at the Foundation. Ms. Fielding also teaches the class “Acting, Life, and the Opposites” at the Foundation, and is one of the authors of the book Aesthetic Realism: We Have Been There (“I Believe This About Acting”). She also taught a course on acting at the HB Studio in Manhattan. She studied Aesthetic Realism with Eli Siegel beginning in 1953, and now studies in professional classes taught by Ellen Reiss, Aesthetic Realism Chairman of Education. Ms. Fielding was married to the late Sheldon Kranz, Aesthetic Realism consultant, editor and poet, and is a consultant along with colleagues Barbara Allen and Meryl Nietsch-Cooperman in the trio There Are Wives, who teach the monthly “Understanding Marriage!” class at the Foundation. She has done critical studies of the marriages of Eleanor Roosevelt, Julia Ward Howe, Harriet Beecher Stowe, Sofia Tolstoy, Carlotta Monterey O’Neill, Eileen O’Casey, Joan Didion, and a technical study of how the mistakes in marriage are like those in acting—in both, opposites are not one! Ms. Fielding is an instructor, with colleagues Barbara Allen, flutist, and Edward Green, composer, of the Opposites in Music Class. At public seminars given to celebrate the New Year, students in this class present exciting, scholarly papers on instances of music from Vivaldi to the Beatles, Prokofiev to Louis Armstrong—and more! She was born in New York City; graduated from the School of Performing Arts, and studied acting with Michael Howard and musical comedy with Charles Nelson Reilly. She is a member of Actors’ Equity and AFTRA. Ms. Fielding is an Obie Award winner for the role of Sasha in the first American production of Chekhov’s Ivanov, a role she was invited to recreate for the CBC television production of the play in Toronto. She has performed on TV both here and in Canada, and appeared for two seasons with the American Shakespeare Festival in Stratford, CT (Antony & Cleopatra; The Winter’s Tale; Richard II; Henry IV, Part I); with New York Shakespeare Festival (A Midsummer Night’s Dream); and in its school tour as Juliet in Shakespeare’s Romeo & Juliet. She appeared on Broadway in the musical Juno, (Marc Blitzstein) and Once Upon a Mattress; (Mary Rodgers); off-Broadway in Montserrat, by Lillian Hellman; Juno & the Paycock by Sean O’Casey; The Beaver Coat by Gerhardt Hauptmann; Don Carlos by Friedrich Schiller; Major Barbara by George Bernard Shaw; and in summer theatre as The Girl in The Fantastiks. Since 1994 Anne Fielding and her colleague, Aesthetic Realism consultant Jeffrey Carduner have been popular speakers at senior centers in Manhattan, Queens, the Bronx, Long Island, Connecticut, North Carolina and Florida, presenting such urgently needed talks as: “Using Love, the Family, and Age to Like the World: Aesthetic Realism Shows How;” “Every Person Can Tell You About Yourself;” “Love Is for Liking the World;” “Memory Shows We Are Connected to the Whole World.” Many of these talks—at the present time there have been several hundred—are given with Aesthetic Realism Associate Dr. Jaime Torres, and have been presented in both English and Spanish. Ms. Fielding has had articles published in newspapers across the country on how Aesthetic Realism explains such diverse subjects as acting and the drama, marriage and widowhood, and what is happening in the American economy. To see her website, click here.